As you’re working through the physical sciences section of your MCAT you will be faced with unit conversions asking you to multiply or divide numbers by some factor of 10. This can occur in questions such as gram to kilogram or liter to milliliter conversions. 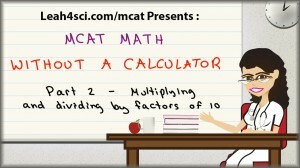 Given the time constraint on the MCAT and lack of calculator, you can’t afford to work out these examples the long and tedious way. Instead you want to use the factor of 10 trick which allows you to simply move the decimal (visible or imaginary) to quickly come up with a solution. Watch the video below for a detailed explanation of this trick along with a few examples showing you how to work it out in record time. Unit Conversions Question 1: Convert 3.47 kilograms to grams. Unit Conversions Question 2: Convert 0.53 grams into kilograms. How would i use this trick when multiplying 0.044 ×(2/3)? Im trying to solve a stoichiometric problem without a calculator. How would the decimal trick work when dividing. For example 0.7/25 ? I’d simplify this one and combine with the other tricks. 7/21 = 1/3 since both divide by 7. The answer is GREATER since we rounded so.. Thank you. When do you take your MCAT?